18/10/2018 - The Organisation for Economic Co-operation and Development (OECD) and Papua New Guinea's Internal Revenue Commission agreed today to gear up efforts to tackle tax base erosion and profit shifting by multinational enterprises in Papua New Guinea, through participation in the OECD/UNDP Tax Inspectors Without Borders initiative. This project sends tax experts to developing countries to work with local officials on audits of large companies, resulting in over USD 400 million of additional tax revenues worldwide to date. Deputy Prime Minister, the Hon. Charles Abel and Ben Dickinson, Head of Global Relations and Development, at the OECD Centre for Tax Policy and Administration, exchanged letters paving the way for experts to be deployed to the Internal Revenue Commission. Speaking at a signing ceremony at the end of the APEC Finance Ministers meetings hosted by Papua New Guinea this week, Deputy Prime Minister Abel said: "Large companies must pay, and must be seen to pay, their fair share of taxes here in Papua New Guinea. Joining the Tax Inspectors Without Borders Programme will help achieve that objective and will protect our revenue base, particularly in the mining, forestry and fishing sectors." 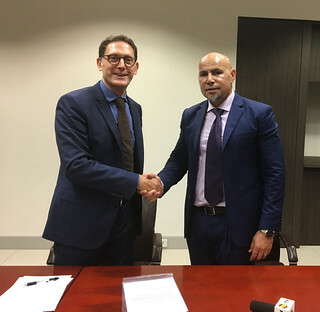 Ben Dickinson added: "We are delighted to provide a practical boost to Papua New Guinea's ongoing efforts to address tax base erosion and profit shifting, and to raise revenues for development." The first deployment of Tax Inspectors Without Borders officials to Papua New Guinea is planned for early 2019. For further information, please contact the TIWB Secretariat, Lawrence Speer in the OECD Media Office (+33 1 45 24 79 70), or Marilyn Watuna at Papua New Guinea's Internal Revenue Commission (+675 322 6897).